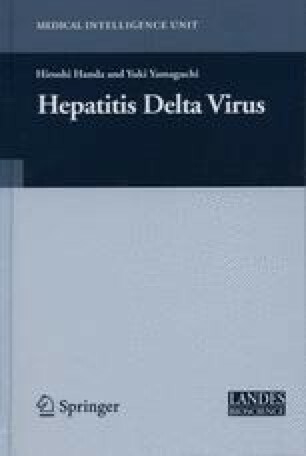 In the early days following the discovery of the hepatitis delta virus (HDV) much emphasis was given on the severity of delta hepatitis and its rapid progression to cirrhosis and liver failure. However with time going on, evidence started to accumulate indicating that in several individuals, chronic HDV infection could run a benign course, with silent clinical and even biochemical features and that in such patients liver histology would be more consistent with the mild changes of chronic persistent hepatitis rather than with the severe necroinflammation and advanced fibrosis of chronic active hepatitis.1-4 In particular the search for serological markers of HDV infection in the general population of several communities worldwide and among blood donors (Japan, Taiwan, Greece and Italy)3,4 revealed that the actual spectrum of delta hepatitis is very wide and heterogeneous and that similarly to the infection with the other known hepatitis viruses it can range from a very mild, clinically latent disease to florid active hepatitis and decompensated cirrhosis. With time going on and with the accumulation of new data from long-term follow-up studies4,5 it also became obvious that the natural course of acute and chronic HDV infection is extremely variable and includes all pos-sibilities from complete cure and burning out to slow progression, rapid progression, develop-ment of cirrhosis and liver failure and development of hepatocellular carcinoma (HCC). Fur-thermore with the application of refined serological, virological and other laboratory techniques, the clinical aspects of HDV infection could be associated and linked meaningfully with nu-merous viral, host and other variables.